I don’t know if I ever mentioned this, but a while back i put together a senorspine.net design for Shaun that I really like. It’s just some links to a few of his game profiles and his blog, so it’s not like an actual website, but it’s a good use of the domain name. A bus pulls up. I board it. Hobart passes. So does a brewery, a church. 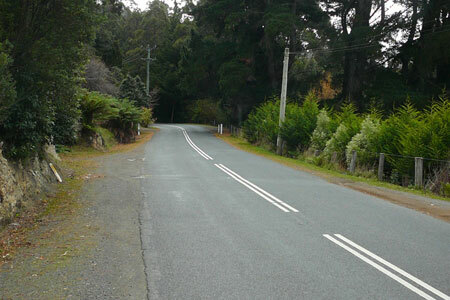 The bus winds up a steep, black road, making sharp turns as the road switches back. I don’t know where to get off of it. The bus has nowhere left to go. It has finished its route. I don’t know where I am. I don’t know where to go. I watch the bus turn. It goes back the way it came. I pick a direction. Start to walk. The sun is bright but it is very cold. It is pretty in a Vancouver-Island sort of way. There is a rainbow in the distance. It arcs over Hobart. Rain falls. The road is narrow, and there is no sidewalk. Blind corners are stressful. Tread marks in the mud lend me little confidence. Time passes. I come upon maybe a town centre. A cylindrical stone hut sits by the side of the road. I don’t know what it wants. There is a convenience store, across from it a pub, and not much else. It must be Fern Tree. I’m probably in Fern Tree. I turn left. There is an entrance to a trail. I follow it. It leads into the woods. Branches and leaves distract some rain. There are fern trees here. 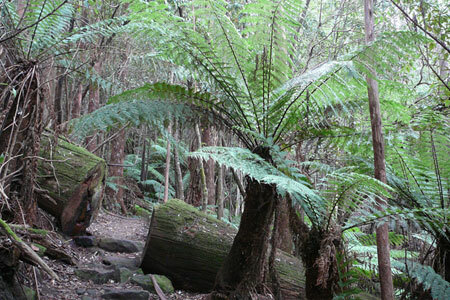 They are like trees, but topped by ferns. So weird. I see markers commemorating distance or death, naming trails. A bench made of stump. The rain stops and starts with twisted, liquid logic. The forest divides. I am on a sort of dirt-road. A pipe runs up it, a little left of centre. I play walking-games and jump from stone to stone. I leave the trees behind. I walk now on grass. Past picnic benches, and a parked car. There is a vertical and covered trail map. It tells me where I need to go. I don’t ignore it, but do not trust it. I choose my direction accordingly. 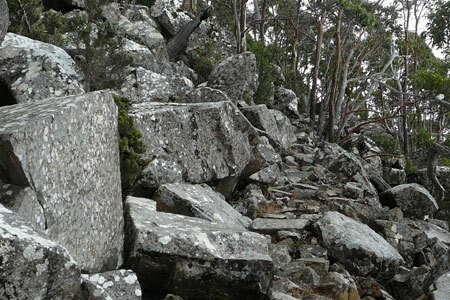 It is said that the Organ Pipes walk forms a loop. The trail map said it. But the lower trail is closed. Something about a fallen tree. I conquer a five-foot step to a grassy plateau. 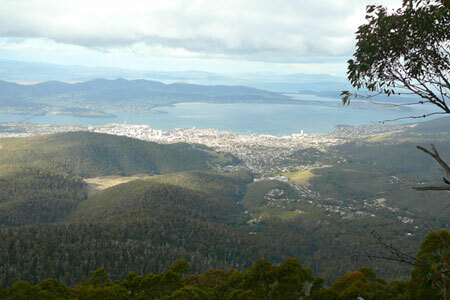 Below are tree covered hills, Hobart, and the ocean. Above a drop of rain. At times the path is forested, at others stone-covered slopes where the trail becomes slightly smaller but no more evenly arranged rocks. At times it is open. I perspire, not much at all. Still, it feels strange with fingers numb and extremities tingling from cold. It is 2:20 pm, but it is winter. The sun will set early, not long from now. I’ve reached the end of the trail. I’ll have to hurry to beat the dark. I run down the mountain, stepping only on outcropped rock, and walk in turns. I come as close as I have in years to turning my ankle (it’s not very close) but have at least a drop and loose rock to blame. I pass the picnic benches and find once more the wide-dirt-and-piped-path. I come out on a road. Not at all where I’d been before. I should really organize my time better. It’s go back or follow the road. Going back is for quitters. And the road leads downward. The road ends at another. I don’t know where I am. A spider is watching me from its prison of glass and i do not enjoy it	Dear Diary, we are friends. Where you eventually ended up, apparently the internet had too. Well done. I dunno why; I usually find not knowing where I am pretty enjoyable. How do you find out again?